Canada has two official languages: English and French. 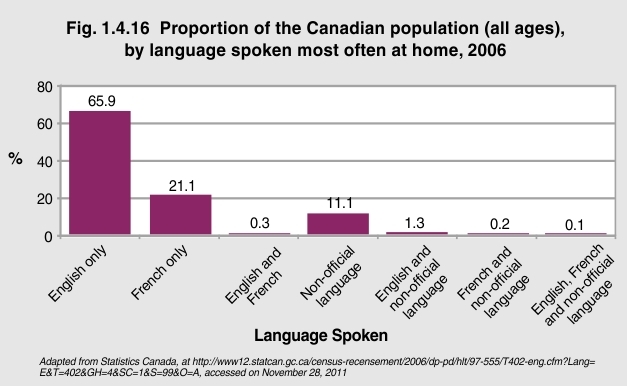 The 2006 Census found that approximately 89% of Canadians spoke at least one official language in the home. The majority—20,584,770 people or 66% of the overall population—were exclusively English-speaking, while 6,608,125 (21%) were exclusively French-speaking. Less than 2% of the population were bi- or multilingual in the home. Of the population—11% or 3,472,130 people—spoke only a non-official language at home. Canada is truly a multilingual country. With 11% of the population speaking neither English nor French at home, there is a great need for resources and services to be provided in a linguistically appropriate fashion.